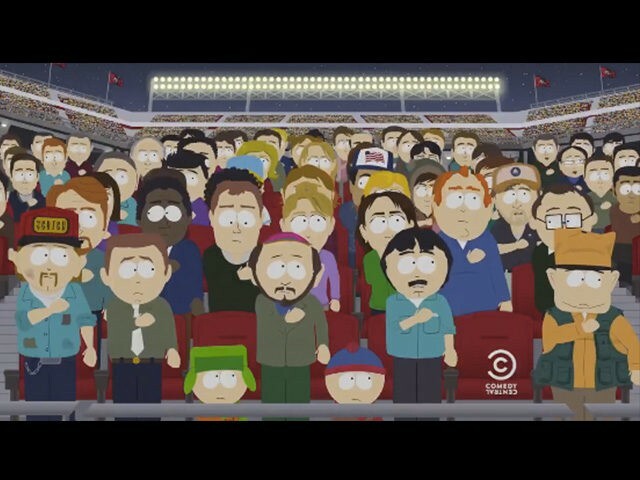 Fresh off of a season that took merciless aim at the absurdity of social justice warriors and overly politically correct culture, South Park returns on Wednesday for its 20th season by diving head-first into another controversy — the Colin Kaepernick-inspired protest demonstrations during the National Anthem. In a teaser for the new season posted to the show’s official Twitter account Monday night — just as the San Francisco 49ers kicked off their season-opening game against the Los Angeles Rams — the South Park gang sings an “updated” version of the National Anthem that would perhaps be more in tune with the quarterback’s feelings about policing in America. The move sparked other players in the league to protest during the Anthem, including Denver Broncos linebacker Brandon Marshall and members of the Seattle Seahawks, Kansas City Chiefs, Miami Dolphins and New England Patriots. Last year’s season previously skewered anti-law enforcement liberals when the newly “PC” citizens of South Park banished “racist, trigger-happy” police officers from town.